Andrei Vasilevskiy allowed 1 goal on 22 shots for the victory. It's Vasya's first regulation win in nearly a month, and while his save percentage still languishes below the .900 line, he did manage to even his record at 2-2-3 with the win tonight. So, you hope he's been through the worst of it and now we're going to see him really start to live up to his potential from hereon out. Mike Angelidis, Jonathan Marchessault, and Dalton Smith were the game's three stars. It's been a while since Syracuse absolutely smashed a team like this, and it's a beautiful thing to see the depth of this team come to the forefront and to see such a solid defensive effort limiting a team to 22 shots on goal. Dalton Smith has taken the wisdom from his father and uncles to heart. 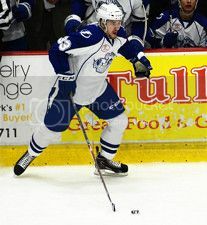 The Syracuse Crunch power forward, whose father, Derrick Smith, and uncles, Keith and Wayne Primeau, each played more than 500 NHL games, was told to find a way to make an impact in every game. Smith, known more for his work with his fists than producing points, scored twice in each of his last two games to take the team lead in goals scored. Comeback Crunch craft a point. Andrei Vasilevskiy allowed 5 goals on 35 shots for the loss. Patience is the word of the hour with Vasya. Patience. It'll come. Syracuse had a strong 2 goal comeback in the Third Period to steal a point on the road, keyed by the play of Dalton Smith and Tanner Richard. Richard has 2 goals and 4 points in the last 2 games, and Smith has 4 goals over the same span to take the Syracuse team lead in goals. People forget Smith is a former 2nd round, 34th overall pick. He has always had some power forward potential and upside greater than that of just a lumberjack. Turning point of the early season? Kristers Gudlevskis allowed 4 goals on 27 shots for the win. He wasn't good, and gave up a couple of questionable goals. But, the Crunch had his back in the Third Period tonight. Yanni Gourde, Dalton Smith, and Jonathan Marchessault were the game's three stars. Gourde gets the monkey off his back in a big way after not potting a goal all season by getting 2, including the game winner. Being down 3 goals in the Third Period in pro hockey is supposed to be a death sentence. Teams in that position seem to lose 98-99% of the time. It's a rare and sometimes galvanizing thing if a team can come back against those odds, and a hugely demoralizing thing to the team that blows that kind of lead. So, for Syracuse to overcome those odds tonight is no small thing, and is likely to give them some momentum as a team that they can carry forward from here on out into the season. Big, big win. I'd also be remiss if I didn't point out the role Tanner Richard played in the comeback, as the next wave of Lightning prospects starts to step it up.